Old Spice Really Stands Behind Its Hardest Working Collection | Valet. This is some legendary pit protection. Old Spice pitchman Bob Giovanni is here to demonstrate the odor-attacking and sweat-pummeling properties of the new Old Spice Hardest Working Collection's Odor Blocker and Sweat Defense anti-perspirant/deodorants—delivering Legendary Protection for Legendary Men like a torpedo of freshness to your armpits. 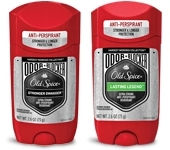 To confidently stand behind the Hardest Working Collection's preeminent performance credentials, Old Spice is going back to the brand's man-molding performance roots and relaunching its 1-800-PROVE-IT money-back guarantee. If consumers use the Hardest Working Collection and the products do not mercilessly crush sweat and odor, they can call 1-800-PROVE-IT for information on how to receive a full refund. Take legendary to the edgendary, and check out the Old Spice YouTube page for more of their latest #smellegendary videos!